Joplin, Mo. 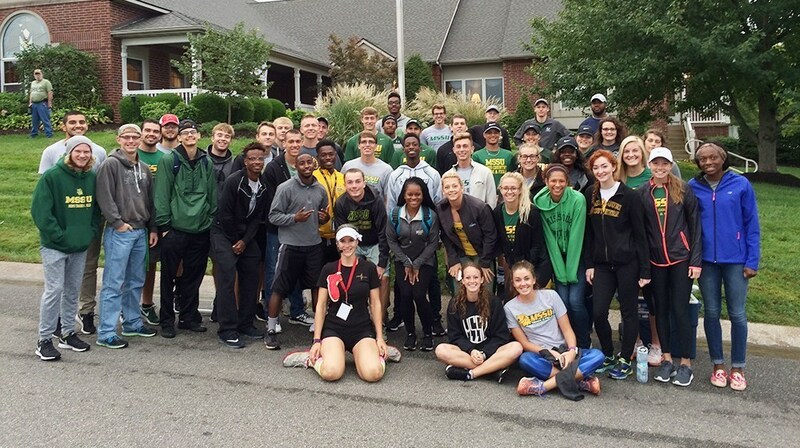 — This past weekend, student-athletes and staff with the Missouri Southern track and field and cross country teams, as well as the men’s basketball team all helped out and lent a hand in the production of the Big Red Shoe Run in Joplin. The race that pits a kids fun run, a 5k, 10k and 15k throughout the city, helps raise funds for the Ronald McDonald House of the Four States. The teams helped with set up, finish line and starting line cheering sections, as well as helping to encourage the runners throughout the course. The race brought in over $37,000 to help go toward the the mission of the Ronald McDonald House. A complete photo gallery of the event can be found on the MSSU Athletics Facebook page by clicking on the link above the story.